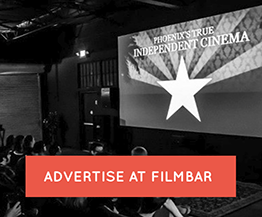 At FilmBar, enjoy food, drinks, movies, and relaxation in our one-of-a-kind independent theater here in downtown Phoenix. We specialize in Indie and Foreign flicks, as well as Cult, Classic, Retro, and Locally Made films. No matter what your taste is, FilmBar has something for you. Choose from a wide variety of craft beer and wine to go along with your picture show experience, and when you get hungry, enjoy an award-winning tamale from The Tamale Store, fresh popcorn and candy. Stop by for a drink – stay for a movie! FilmBar has won the Phoenix New Times Best of Phoenix “Best Indie Cinema” numerous times! We have worked each year to refine and improve what we do by working to understand what the community is looking for in an Indie theater. We hope you check us out soon for a truly unique movie theater experience. Phoenix New Times Best of Phoenix “Best Independent Theater” – 2011, 2012, and 2013, 2014, 2016. Currently (mid 2017) #2 on Airbnb’s 30 Best Movie Theaters in Phoenix list. FilmBar is located in the Roosevelt Row neighborhood on 2nd Street just south of Roosevelt.